01/02/2016: Added a Stahlwille Stabil 22x24mm Offset Box Wrench. 12/17/2015: Added a Hazet 645 1/2x9/16 Flex-Box Wrench. 12/13/2015: Added a Gedore 1B 16mm Offset Combination Wrench. 01/09/2012: Moved Bahco to this page. 01/08/2012: Added a Gedore 1B 5.5mm Offset Combination Wrench. 01/06/2012: Added a Heyco 475 17x19mm Offset Box-End Wrench. 12/18/2011: Added a Dowidat DIN895 17x19mm Open-End Wrench. 12/16/2011: Created page, added a Elora 1305/5 Single-Offset Box Wrench. 02/20/2011: Added a Bahco No. 70 Adjustable Wrench. 12/25/2010: Added a Bahco "Volvo" 8 Inch Adjustable Wrench. 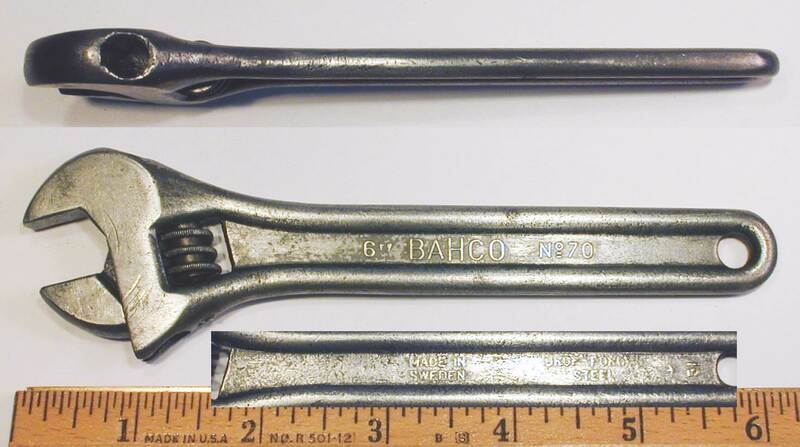 07/27/2010: Added a Bahco L18-19 Flex-Box Wrench. 08/25/2009: Added a Heyco 350 17x19mm Open-End Wrench. 08/11/2009: Added a Heyco 497 Double Flare-Nut Wrench. 12/15/2008: Added a Hazet 2513 Tappet Wrench. 11/28/2006: Added Knipex 300 Side-Cutting Pliers. In 1890 the early company operations were acquired by Berndt August Hjorth and renamed to B A Hjorth & Company. The company name was later shortened to AB Bahco. In 1999 Bahco was acquired by Snap-on, and Bahco currently operates as a division of Snap-on. Fig. 1. Bahco No. 70 6 Inch Adjustable, with Insets for Side View and Reverse Detail. Fig. 1 shows a Bahco No. 70 6 inch adjustable wrench, marked with "BAHCO" and the model number forged into the shank, with "Made in Sweden" and "Drop Forged Steel" forged into the reverse. The overall length is 6.1 inches, and the maximum opening is 0.8 inches. The head thickness was measured at 0.44 inches. Note that the shank has a depressed channel running all the way to the adjusting knurl on both sides. This feature provides extra clearance when making an adjustment and is believed to have originated with Bahco. The depressed channel feature was later adopted by Crescent, and still later by Diamond Tool. Fig. 2. Bahco "Volvo" 8 Inch Adjustable and Alligator Wrench, with Insets for Side View and Reverse Detail. Fig. 2 shows a Bahco 8 inch adjustable and alligator wrench, marked with "BAHCO 31" plus "V-Steel" and "Made in U.S.A." forged into the shank, with "AB Bahco Stockholm" and a "229" code forged into the reverse. The reverse is also stamped "Volvo", suggesting that this wrench was probably made for a Volvo tool kit. The overall length is 8.0 inches, and the maximum opening is 1.2 inches. The head thickness was measured at 0.52 inches. Fig. 3. Bahco L18-19 18mmx19mm Flex-Box Wrench, with Inset for Reverse. Fig. 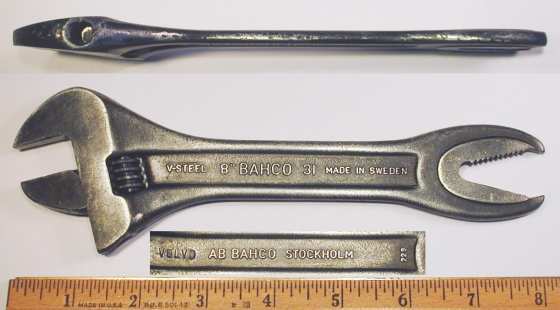 3 shows a Bahco L18-19 18mmx19mm flex-box wrench, marked with "AB Bahco Stockholm" and the metric sizes forged into the shank, with "V-Steel" and a "Made in Sweden" forged into the reverse. The overall length is 10.3 inches, and the finish is chrome plating. Dowidat (and other German tool makers) uses a model number system in which the "model number" specifies a design or style of a tool, with the particular sizes marked separately. Fig. 4. Dowidat DIN895 17x19mm Open-End Wrench, with Inset for Reverse Detail. Fig. 4 shows a Dowidat DIN895 17x19mm open-end wrench, marked with "Dowidat" and "Made in Germany" forged into the shank, with "Mercedes-Benz" forged into the reverse. The overall length is 6.7 inches, and the finish is black oxide. The design of this wrench is based on the DIN895 standard, with depressed panels on the shank and a reinforcing ridge around the open ends. Some European tool makers prefer a style of combination wrench with the box end offset, as the next two figures illustrate. Fig. 5A. Gedore 1B 5.5mm Offset Combination Wrench, with Insets for Side View and Reverse Detail. Fig. 5A shows a Gedore 1B 5.5mm offset combination wrench, marked with "Gedore-Vanadium" forged into the shank, with "Gedore" and "Germany" forged into the reverse. The overall length is 4.0 inches, and the finish is chrome plating. Fig. 5B. Gedore 1B 16mm Offset Combination Wrench, with Insets for Side View and Reverse Detail. Fig. 5B shows a Gedore 1B 16mm offset combination wrench with depressed panels, marked with "Gedore" and "Germany" forged into the front panel, with "Gedore" and "Vanadium" forged into the reverse. The overall length is 8.6 inches, and the finish is chrome plating. 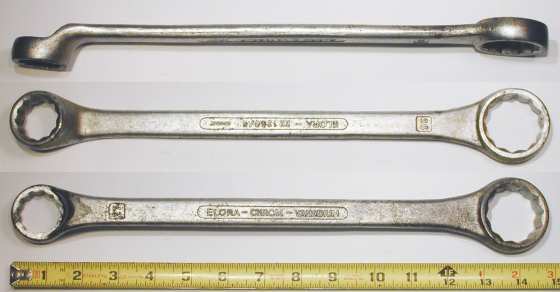 Elora is a German tool company founded in 1924 and continuing today as a family-run business. Interested readers can find more information at the Elora [External Link] web site. Fig. 6. Elora 1305/5 27x36mm Single-Offset Box Wrench, with Insets for Reverse and Side Views. Fig. 6 shows an Elora 1305/5 27x36mm single-offset box wrench, marked with "Elora - Chrom - Vanadium" forged into the shank, with "Elora" and "Germany" plus the model number forged into the reverse. The overall length is 14.8 inches, and the finish is chrome plating, with extensive losses due to rust. Hazet is a well-known maker of quality tools established in 1868 in Remscheid, Germany. The company offers an extensive selection of standard and specialty tools for automotive and industrial maintenance. Additional information is available from the company's website at Hazet Geniales Werkzeug [External Link] in German, or at Hazet Ingenious Tools [External Link] in English. Hazet (and other German tool makers) uses a model number system in which the "model number" specifies a design or style of a tool, with the particular sizes marked separately. Fig. 7. Hazet 450 16x17mm Open-End Wrench, with Inset for Reverse Detail. Fig. 7 shows a Hazet 450 16x17mm open-end wrench, marked with "Chrom Vanadium" and "Hazet" forged into front panel, with "Original Remscheid" and "Germany" forged into the reverse. Fig. 7B. Hazet 2513 24mm Tappet Wrench. Fig. 7B shows a Hazet 2513 24mm tappet wrench, marked with "Chrom Vanadium" and "Germany" forged into the shank. Fig. 8. Hazet 645 1/2x9/16 Flex-Box Wrench, with Inset for Side View. Fig. 8 shows a Hazet 645 1/2x9/16 flex-box wrench, marked with "Chrom Vanadium" and "Germany" forged into the shank, and with the fractional sizes stamped on the sockets. Heyco is a maker of high-quality tools, forgings, and molded parts, with operations in Remscheid, Germany and several other countries. The company was founded in 1937 by brothers Max and Ernst Heynen, initially as a maker of hand tools for automobile service and other applications. The company maintains a website at www.heyco.info [External Link] with information on the company's divisions and products. Fig. 9. Heyco 350 "BMW" 17x19mm Open-End Wrench, with Inset for Reverse Detail. Fig. 9 shows a Heyco 350 17x19mm open-end wrench, marked with "Heyco" and "W. Germany" forged into the shank, with "Chrom-Vanadium" and "BMW" forged into the reverse. The overall length is 8.7 inches, and the finish is chrome plating with a satin texture. Fig. 10. Heyco 475 17x19mm Offset Box-End Wrench, with Insets for Side View and Reverse Detail. Fig. 10 shows a Heyco 475 17x19mm offset box-end wrench with depressed panels, marked with "Heyco" and "Germany" forged into the front panel, with "Chrom-Vanadium" forged into the reverse panel. The overall length is 11.6 inches, and the finish is chrome plating. Fig. 11. Heyco 497 30x32mm Double Flare-Nut Wrench, with Insets for Side View and Reverse Detail. Fig. 11 shows a Heyco 497 30x32mm double flare-nut wrench, marked with "Heyco" and "W. Germany" forged into the shank, with "Chrom-Vanadium" forged into the reverse. The overall length is 10.9 inches, and the finish is chrome plating with a satin texture. Knipex is a German tool company specializing in high-quality pliers. The company was founded in 1882 by C. Gustav Putsch and is now run by the fourth generation of the family. A web site for the company is available at Knipex.com with information on the company's history and products. Fig. 12. Knipex No. 300 180mm Lineman's Universal Pliers, with Insets for Side View and Marking Detail. Fig. 12 shows a pair of Knipex No. 300 180mm lineman's universal pliers, incorporating flat and rounded gripping surfaces, side-cutters, and Button's style cutting slots. The pliers are stamped with the model number and "Germany" on the underside of the handles. The upper inset shows the slim flat profile of this style of pliers. In addition to the side cutters, the pliers are equipped with cutting notches on each side of the handles. Stahlwille is a German tool maker in Wuppertal, Germany, with operations going back to its founding in 1862 by Eduard Wille. Readers can find information about the company and its extensive range of products at the Stahlwille [External Link] web site. Fig. 13. Stahlwille Stabil 22x24mm Offset Box-End Wrench, with Insets for Side View and Reverse Detail. Fig. 13 shows a Stahlwille Stabil 22x24mm offset box-end wrench, marked with "Stahlwille Stabil" and the (mm) sizes forged into the shank, with "Alloy Steel" and "Made in Germany" forged into the reverse. The overall length is 13.4 inches, and the finish is chrome plating. Rotfuss is a German tool maker (or brand) currently known only by the pliers shown in the next figure. 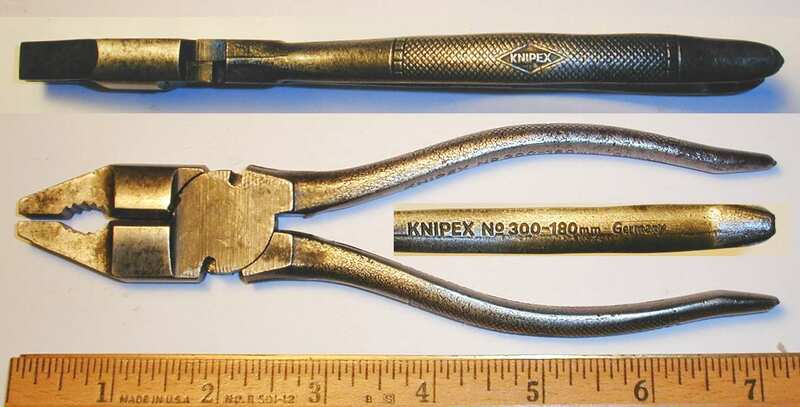 No information has been found for the company, but as the pliers are exceptional in both design and construction, the company is well worth noting in this section. Fig. 14. Rotfuss 10 Inch Adjustable Pliers, with Insets for Detail. Fig. 14 shows a pair of Rotfuss pliers with a unique adjusting mechanism, a circular bearing element moved along a threaded shaft. The patterned handles have forged markings for "Rotfuss" and "Chrom-Vanadium", and the underside of one handle is marked "D. Pat. 806779" and "Germany" in raised letters.